I’ve NEVER danced before. Will I be able to do it? Most people on their first class have never danced a step in their life. Our classes are specifically designed to teach everyone, no matter what your experience. We take it slow and from your first step on the dance floor. Within your first class you’ll be dancing. We build your skills and confidence and before you know it you’ll be a fully-fledged SalSeduce Salsero. No. By all means bring a partner if you want to come together. Bring a friend or come by yourself. However we rotate partners in class so everyone is able to have a dance with a partner. Sometimes there can be an imbalance in the numbers. When this happens, those without partners wait in between partners before the next rotation. Rotating partners allows you to improve your ability to lead or follow and also meet fellow classmates making it easier to practice what you’ve learned in class when social dancing later. Absolutely not! There is no age barrier whatsoever. 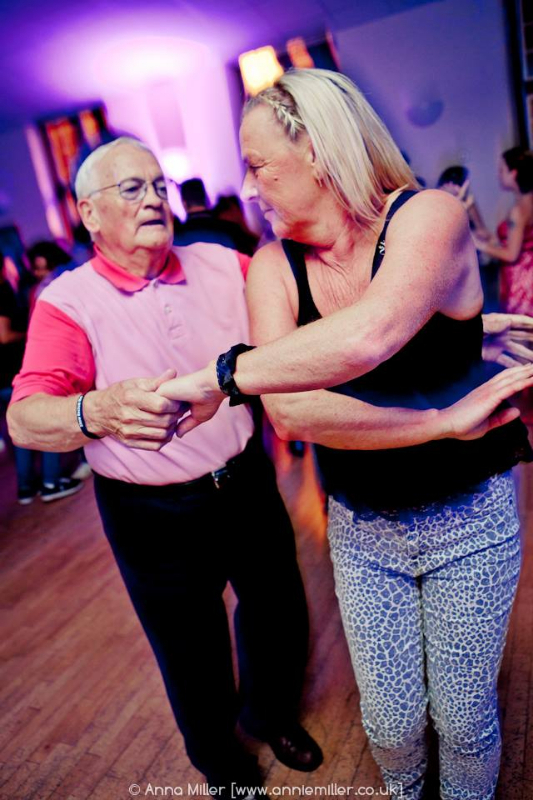 Our dancers range from 16/17 through to some in their 80s and everyone in between. We all mix together and as long as you don’t have any restrictions with your mobility you can learn to dance salsa. You can always sit and watch if there is anything you aren’t able to join in with, but it’s all about having fun, learning to dance and doing it at your own pace. Im a bit overweight, can I still learn Salsa? Of course you can!! Salsa dancers come in all shapes and sizes, backgrounds and abilities, experience levels and ages…we are all on that dancefloor together. What styles of Salsa do you teach? Out of the 3 main styles of salsa: Crossbody (NY/LA), Cuban and Colombian.We teach Crossbody on a weekly basis but also have regular Cuban classes. Often we bring guest teachers from around the globe so they can impart their knowledge and expertise to our dancers and students. In all our club nights and parties we have a mixture of dance styles and music. We cater for all tastes for every dancer. Everyone is encouraged to try new styles and because we are all on the dancefloor together it makes SalSeduce one of the friendliest and inclusive places to dance salsa in the North. For clothing, wear anything that’s comfortable and allows you to move your arms and legs easily. It’s a smart casual night so we sometimes say ‘whatever you’d go to the cinema in’. Or if you’re coming from work office-wear is fine. Avoid anything that you may trip on or prevents you from lifting your arms up. On your feet, just wear a regular pair of smooth soled shoes or trainers. You’re going to be spending a lot of time moving in around in them, so comfort is the key. Ladies a small healed strappy shoe is ideal or a comfortable secure flat shoe. Avoid slip-ons, sandals or anything that can easily come off your foot when you lift it up. Trainers are ok as long as they don’t stick to the floor. For our weekly drop in classes you can pay cash on the door. For our monthly parties (SalSabado and The Chill Out Lounge) you have the option of securely paying online with Paypal when using our online booking system. Visit our shop page via the main menu. Beginners have the option of buying a 4 week pass from our online shop. Once you have this you just show the voucher on Tuesday and Thursday (Cannot be used on a Friday night at the Black Swan). Pre-paid online tickets offer the best value tickets available and also guarantees you entrance as sometimes we may limit numbers and our events sell out. Just turn up….Either Tuesday (St John the Baptist), Thursday (South Gosforth Social Club) or Friday (Black Swan)….that’s it!! You can either book a Beginners package online using our secure online shop using PayPal for a great deal….or you can pay as you go on the door in cash. Decide if you want to join the group classes or you’d prefer to start with some Private classes to build your confidence. If you want to come to either one of our SalSabado Monthly parties or Chill Lounge Sunday events, get your pre-paid ticket from the online shop. Or if you would prefer a chat you can either call or message me for more information on any of our nights, classes, directions, parking or my Pomeranian…ask away it’s all good.